The reaction has four stages, and it creates cascading business results since each stage continues and magnifies results from preceding stages. To start it, you need to have several activities in place, which are shown in the infographic’s red quote bubbles. Quote bubbles in subsequent stages are also actions by firms that sustain and grow the reaction. In digital social public, firms break some rules in order to demonstrate that they value employees’ and customers’ trust more than profit. * In digital public, firms listen first, validate their understanding, and respond to people to help them attain the outcomes they want when they work (employees) or use products/services (customers). Firms admit their weaknesses in digital public; they share insights about their weaknesses without defending themselves. They admit they aren’t for everyone. They stop selling because they trust people to be smart enough to know when and what to buy (and where to work). In summary, they put people ahead of themselves. That’s what sparks and builds the Trust-Business Chain Reaction. The reaction only works when firms’ trust of people is authentic; firms must truly put people first, and this can’t be faked. Firms can fool some people individually, but they cannot fool groups of people in digital public, where one person can expose them and everyone sees instantly. When firms sincerely and consistently put people first, the reaction starts building after a certain amount of time, which depends on the groups of people they are serving and how quickly their actions resonate with the group. Each group of people has its own level of skepticism that must be worked through, as snow melts in the spring. That said, firms can accelerate trust building by breaking rules explicitly. For example, they can recommend competitors when they add value to customers’ and employees’ outcomes. ** When people criticize or question them or their products, they encourage the conversation by asking questions and trying to help, in digital public, not “offline.” These actions are very unusual, so people notice, and digital public scales the attention. Within each social venue, social actions indicate progress because people start expressing their gratitude and interacting more intimately over time, so trust level can be measured quantitatively. Each thank you, share, comment of support, like, etc. affects the group as a whole, so that’s a chain reaction in miniature. 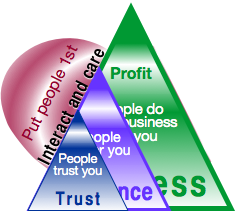 The level of trust of each person in the group is affected, and the group as a whole trusts the firm more. When people trust more, several things start happening that affect profit. Customers become less sensitive to price, and employees to pay. Customer acquisition and recruiting costs start to fall. Employees start recommending the firm as a good place to work, and they talk about it on their personal social media accounts. The firm begins earning employee advocacy. The reaction starts to create significant value during Stage Two, but results continue to build in Stage Three. Having customers and employees be less price sensitive, less likely to switch to competitors and more willing to buy are reflections of how they feel about the firm. Stage Three moves the business value to a social level. More employees actively recommend the firm to their friends as a great place to work, and customers recommend products/services. Notably, employees and customers cite their experiences with the firm (the caring interactions they’ve had or seen) when recommending. Their excitement about the firm, its mission, and its products/services is reflected by customers’ and employees’ social media posts. At this point, the firm’s practice of customer success expands and formalizes, and leaders and employees alike are excited to change policies and make other operational adjustments to support customers, and they often discard former limits of customer service remedies. Human resources and line managers make changes to support employees; for example, they scrap their non-compete agreements and other restrictive rules that reflect low trust. These changes significantly improve the relationships among management and employees. Any pre-existing us and them attitudes in the firm culture dissipate. Stage Three actions also build on each other and feed Stage Four. Each time an employee recommends the firm to a friend who joins, they both increase their pleasure through shared experience and gratitude. A similar dynamic holds for customers who recommend the firm and are subsequently thanked by their other customers. Of course, exceptions always occur, but overall trust and wellbeing accumulates. When people experience misunderstandings and frustrations, the firm takes these occasions as opportunities to show that it’s more interested in doing the right thing for people than worrying about its costs; in fact, exceptions are the most powerful way to show how they put people first. Another powerful force is that when truth-telling, trust and caring are number one within the firm, it serves as a springboard for the firm’s ability to consistently create standout customer experience through interactions with customers. The interactions’ emotional content makes the difference: customers feel it when employees want to help, which is only possible when employees are trusted and empowered. This is at the core of employee engagement programs that produce breakthrough value. Customers by now are enthusiastically giving more share of wallet to the firm, as Apple customers’ are more likely to buy more expensive new models more frequently. Another oft overlooked aspect of employee engagement is employees’ feelings about their employment experiences after they have changed situations. *** They are more likely to keep in touch with current employees and to refer business to the firm because they’ve experienced the firm as rewarding and caring. They continue to refer people as prospective employees, too. The impacts of Stages Two, Three, and Four combine to increase employee productivity, customer lifetime value, and profit. Another potent benefit is that resistance to change falls since people trust each other, so organizational flexibility increases and the cost of digital transformation falls. 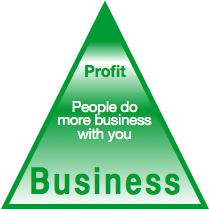 *Commercial firms will be more profitable and stable when they have high trust with their employees and customers. What they must do, however, is to put people ahead of profit. When you trust someone, you honor them, and they reward you. Yes, some exceptions will take advantage, but overall, trusting increases relationship and profit as described in the Trust-Business Chain Reaction. The act of trusting is like throwing the profit ball from one hand to another; only, in the air, the ball gets much bigger. Yes, it’s scary to trust customers with profit, but it’s precisely that trust that they feel; you believe in them, and they feel it. That’s the motor of the whole reaction. **The concept of “outcome” is similar to Christensen’s “jobs-to-be-done,” which asserts that customers “hire” products (and services) to do a job. See Outcome-Driven Innovation. ***The vast majority of firms have many more alumni than employees, and most employees, when they have been empowered and trusted, will always remember that experience—because it’s rare—and they reciprocate. For more, see Alumni 2.0: Employer-Employee Realignment. 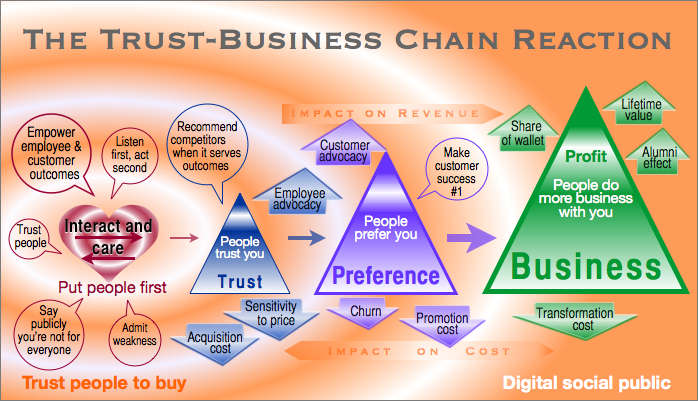 The Trust-Business Chain Reaction describes how caring interactions in digital public with relatively few people consistently affect the perceptions of large groups of people, and how the business impact scales over time. Experiential social media is the discipline of activating and growing the chain reaction. One of the biggest obstacles to activating the reaction is that firms already think they care about employees and customers. Most mean well; their words are nice but their actions reveal lack of trust. Trust is an often used word, but it is highly nuanced. Trust by others is earned—by trusting first. Trust is also highly conditioned by context. More on how trust works in How Trusting Customers Drives Profit. One of the most consistent ways to develop trust is to show you care about people, by serving them. Help them attain the outcomes they want when your product is most relevant. Marketing, which seeks to persuade with words, has been very successful since its modern incarnation in the 20th century. However, persuasion wins battles but loses the war because trust is developed through actions more than words. Trust has an enduring emotional aspect that lengthens and deepens relationships. Interactions in digital public are inherently people-focused, and they serve as the content that money can’t buy. They are relevant, and they show the firm’s real attitudes and priorities. The USI Alarms case study validates much of the Trust-Business Chain Reaction: Experiential Social Media for USI Alarms: How Serving People in Digital Public Boosts Ecommerce Referrals. 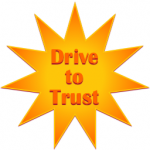 Winning Over the Empowered Customer: Why Trust Matters (global IBM study). Learn about how trust drives customer experience, employee engagement, customer success, and digital transformation on the Social Channel App Open Community.